I'm back with some more Christmas inspiration from the Art With Heart Team. For tonight's card I have used the Beautiful Baubles stamp set from the Holiday Catalogue. I stamped the multiple bauble image on Shimmery White card stock with Versamark and embossed with Silver Embossing powder. The image was coloured with an Aquapainter and inks. The beautiful embellishments are punched with the new Sprig punch from Silver foil and Tranquil Tide Glimmer paper from the new Joyous Noel Glimmer pack. I also used half an Iridescent Boxwood Wreath under the greeting. 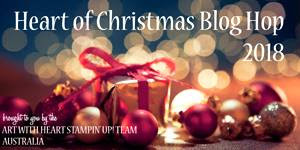 For more Christmas inspiration head to Claire Daly's blog for a full list of participants.